This dissertation seeks to understand how democratic elections can coexist with a significant number of politicians implicated in criminal wrongdoing. Specifically, it seeks answers to three questions. Why do parties nominate candidates with criminal backgrounds? Why do voters vote for them? And what does their proliferation mean for democratic accountability? To address these questions, I draw on a wide body of quantitative and qualitative evidence from India, the world's largest democracy. I argue that parties are attracted to criminal politicians because they have access to financial resources that allow them to function as self-financing candidates. Whereas the prevailing consensus in political economy suggests that voters support "bad politicians" because they lack adequate information on candidate quality, I develop an alternate theory that suggests well-informed voters can display rational behavior by voting for such candidates. Specifically, in contexts where social divisions are highly salient, voters often desire a representative who they perceive can protect group-based interests most credibly. In such settings, criminality can serve as a useful signal of a candidate's credibility. As a result, parties selectively field criminal candidates in those areas where social divisions are most pronounced. The implications of this study are far reaching because they suggest that information about a candidate's criminality is not only available, but actually is central to understanding the viability of his candidacy. Thus, there are circumstances in which "bad politicians" can in fact be compatible with democratic accountability. 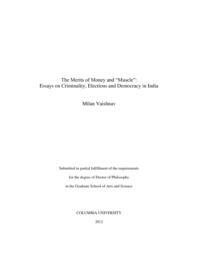 Empirically, this dissertation makes use of a unique, author-constructed database of affidavits submitted by more than 60,000 candidates contesting state and national elections between 2003 and 2009. This dataset contains detailed information on candidates' financial and criminal records from 37 elections, which I analyze using state-of-the-art quantitative methods. I complement these quantitative analyses with qualitative fieldwork conducted in three states, including an in-depth exploration of the case of Bihar, a state in north India.